The Krill Lamp by Kriana Corporation was developed as a battery powered replacement for chemiluminescent lightsticks (Cyalume and Snaplight, both brand names manufactured by Omniglow Corp.). Using a pair of AA-cell batteries and electroluminescent ("EL" for short) technology, the Krill Lamp addresses some of the shortcomings of traditional chem-lights. 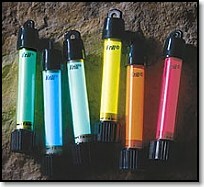 Chem-lights have long been a handy and useful survival tool, as well as generally useful in many circumstances. Available in a variety of sizes, shapes, and brightness they have become almost ubiquitous in the military and law enforcement, and among outdoors and survival enthusiasts. With relatively long storage life for the standard units, light weight, cool, safe in potentially explosive atmospheres, and easy to use, these chem-lights supply needed light in many situations, emergency and otherwise. Many have come to use them as a standard lighting source for some types of operations. However, they have their shortcomings. Once activated by breaking the internal vial and combining the chemicals, they cannot be turned off. That can be inconvenient, as well as annoying. They provide increasingly less illumination as temperatures drop, even at temps well above freezing, and less duration as temperatures increase above 80 degrees F. The high intensity chem-lights were originally developed to combat the cold weather problem. While they last only a short time at normal temperatures (5 and 30 minutes), they last longer, if not a long time, at low temperatures and give more illumination. Whether you need 360-degree illumination or not, that's what you get. The chem-lights are also relatively expensive, even when purchased in bulk quantities, with only a single manufacturer holding a monopoly. Not a problem if you only need a few for your kit or a trip, but a real expense for those who use them regularly. They also present some storage problems. They must be kept in their airtight packaging or they will become inert in short order, especially so in humid climates. If the packaging is inadvertently punctured, you are out of luck. As a result, packing them inside tightly packed containers such as life rafts present potential problems. Storage life varies from as short as a year for high intensity versions up to four years for the standard 8- and 12-hour versions. If they leak, which has been known to happen, almost always the result of being inadvertently crushed, they make a real mess, and though the chemical is non-toxic, it does stain (and it doesn't come out, as my wife can attest). First, lets look at the electroluminescent electroluminescent ("EL" for short) technology used in the Krill Lamps, since it's probably not familiar to most of us (photo left and diagram below courtesy of Rogers Corporation). Actually, it probably is, though we likely don't recognize it specifically as EL technology. It is commonly utilized in many flat panel displays used in a variety of electronic devices from handheld computers to the Space Shuttle and provides backlighting for keyboards and screens in everything from cell-phones and GPSes to automotive instruments. An example you're likely familiar with is found on the popular Timex "Indiglo" line of watches where the EL lamp is used to illuminate the surface of the watch dial, and which many have discovered is bright enough to actually be used as a dim night lighting device in a pinch. An EL lamp is electrically similar to a capacitor and consists of a dielectric (non-conducting) layer and a light emitting phosphor layer sandwiched between two conductive surfaces, at least one of which must be transparent or translucent. The dielectric layer serves to allow the lamp to withstand higher voltages without shorting between the conductive surfaces. The voltages required to make an EL lamp work are relatively high, from 80 to 100 volts in the case of the Krill Lamps. EL lamps illuminate when powered with alternating current (AC-power). In order to use the 3-volt direct current (DC-power) from the pair of AA-cell batteries in the Krill Lamp, an inverter is required. In concept this is not unlike the inverters that are available to allow you to operate regular household AC-current power tools and such from a car battery, but obviously this inverter is considerably miniaturized and solid state. As voltage is applied to the conductive surfaces, an electric field is generated across the microencapsulated phosphor and dielectric layers. Twice during each cycle (AC-power, remember) the electric field excites the phosphors and the phosphors emit light through the transparent front conductor of the lamp. Voilá! We have light. With no filament to break, EL lamps can be very rugged and impact resistant. They are also a "cool" light source, with little energy wasted in heat production. As such they tend to be very energy efficient. What they are not particularly good at is point lighting for use as a directed light beam (such as an incandescent bulb in a flashlight), rather they do well at general illumination. Finally, the EL lamp has a long lifespan, in the case of the Krills, 2000 hours minimum, with 3000 hours not unusual. Kriana has taken this technology and incorporated it into their Krill Lamp. Compared to the 8- or 12-hour life of a standard chem-light, the Krill's 120- or 50-hour life for the standard and "Extreme" models, respectively, is a big improvement. Even better, you can turn them off! So, their effective life can be even longer, because we rarely need the light to actually be on for 8 or 12 hours at end, though there are exceptions, some of which could really make use of those many hours of illumination without replacement. If you only need a light for a couple hours a night, for example, which is typical, then it would take 60 or 25 chem-lights to equal one Krill, depending upon the model. In our tests with fresh Duracel alkaline batteries the Krills actually delivered about 10% greater useful life than Kriana's spec, so the numbers are even better in the Krill Lamps' favor. They also delivered an additional 50% longer life at reduced levels, before dimming significantly. In the case of the 180 Extreme model, this reduced level of illumination was still adequate for many uses, about what the standard 180 Krill normally delivered. There was some minimal dimming as the lamps approached their rated life, but it really wasn't very noticeable except when compared side-by-side to a Krill with fresh batteries. The Kill Lamps come in four versions and six colors in each version. The standard Krill gives off 360 degrees of light, in other words around the entire circumference of the tube, just like a chem-light. The 180 Krill produces light only on one-half its circumference, or 180 degrees, hence the name. It has a 1 inch (2.45 cm) wide by 3 inch (7.62 cm) long piece of Velcro hook attached to the other half, coupled with an adhesive backed piece of Velcro loop to enable it to be easily attached to most surfaces. The brighter, shorter-lived Extreme models also come in both a standard (360) and 180 version. Colors available are the "standard" Green (which is really more of a blueish-green shade) as well as Blue, White, Yellow, Orange, and Red. The green is NVG compatible and the blueish-green shade is also the color that will provide the best natural visibility at very low illumination levels, but conversely, will most easily adversely affect your night vision capability if too bright. If retention of night vision acuity is the goal, care must be taken to use the minimum acceptable illumination level. To retain your night vision, a red light has been the traditional choice since before WWII when the military settled on red as the best choice. Recently, there has been a move to green and blue-green light. Which is really better? Well it's not quite cut-and-dried, as our brief explanation, "Green or Red for Better Night Vision?" explains. The unit itself is comprised of a tough clear polycarbonate plastic tube, capped at one end with a Black or Grey polycarbonate cap incorporating a lanyard hole and which houses the electronics, with a similarly colored polycarbonate end-piece and screw-on cap at the other end. The screw-on cap also acts as the switch, a simple brass end piece making contact with a metal ring on the tube to switch it on. Screw it in (clockwise) to turn on, out (counterclockwise) to turn off. About a quarter turn does it. It is stiff enough that it won't likely be inadvertantly turned on and, of course, this type mechanism is very resistant to being turned on while in storage. An o-ring provides a seal and the unit is waterproof down to 150ft. (45.7m). While waterproof, the lamps are not approved non-incendive electrical devices, so I'd be a little cautious about using them in potentially explosive atmospheres. Kriana has advised me that they will be going for approvals later this year, which will give additonal peace of mind for those using the units, as well as opening up additonal markets. Inside the clear tube, the thin flexible EL lamp is rolled to lay up against the tube, with ends butting, a metal sleeve holding it in place at the bottom and providing a conductor for the negative battery terminal when the cap is screwed down. The batteries slip inside the EL lamp, which is protected by its tough inner conductor and plastic coating. Installing batteries is as simple as unscrewing the cap and slipping them in. There is plenty of room, even for the latest "obese" batteries with built-in power checkers, they just fall in and out with room to spare. A spring at the top provides tension when the cap is screwed on. Kriana claims the lamp can survive a drop onto concrete from 50ft. (15.2m). We dropped one from 65ft. (19.8 m) a half-dozen times on both its top and bottom with no problems except a few scratches. We also ran over it with a 3/4-ton pickup truck and it still worked. Having noted all that, however, we must also note that the electronics of the unit and the associated circuit board are not potted, and if there is a weak point to any electronic design that is subject to abuse, it is usually found there. Only long-term experience will show just how robust it really is, but we don't foresee any problems. The connections we observed when we opened one up were well made and appeared adequate to withstand the vibration and shock that is usually the killer for such circuits. We don't have extreme low temperature testing equipment, but we did stick them in the freezer and even froze one while operating inside an oversized ice cube and had no problems, nor was there was any change in light output. Kriana claims the batteries will die in cold weather well above the temperatures the lamp is capable of operating down to. That's a major improvement over the chem-lights. Storage life for the unit itself is unlimited. The batteries have shelf-lives, of course, from a typical four to five years for standard alkaline batteries to 10 years for lithiums. The lithium batteries will also last much longer in use and provide more power in frigid temperatures. The screw-on cap with its four sets of ridges for improved grip represents the largest diameter of the unit, 1.08 inches (27.4 mm). The fixed end-cap is .88 inch (22.4 mm), while the tube itself is .75 inch (19 mm) in diameter. It is approximately 5.1 inches (12.95 cm) in length. So it is shorter than the standard 6 inch (15.2 cm) chem-light (there are also shorter and longer chem-lights available) and a bit fatter at its widest point compared to the typical .75 inch (19 mm) end cap of the chem-light. The lit portion of the Krill is 2.75 inches (7 cm) in length, about .75 inches (19 mm) shorter than the lit length (liquid portion) of a standard chem-light when standing on end. Speaking of which, the wider base makes the Krill much more stable when standing on its end, helped along by the heavier weight of the Krill. The difference in weight is fairly significant, though what that really means depends upon your point of view and what uses you plan for them. In many cases the weight won't matter. The standard 12-hour chem-light weighs in at 0.9 oz. (25.5 g). The Krill Lamp weighs a comparably hefty 2.7 oz. (76.6 g) with batteries, approximately 2.1 oz. (59.5g) if you use lighter lithium batteries instead of alkaline. So, one Krill Lamp weighs about what three chem-lights do, if you use alkalines, but only two if compared using lithiums. However, those three chem-lights will give you only about 36 hours maximum illumination, compared to 120 or 50 hours on alkalines for the Krills, which to match would require 10 or 4 chem-lights, respectively. With lithiums, the spread only gets better, or worse if you're Omniglow. The comparison becomes even more striking if you have to illuminate something for longer periods, as additional AA-cell battery pairs run only 1.6 oz (46 g), a mere 1 oz (29 g) using lithiums. Of course, as noted previously, if you really just need a couple hours of light an evening, and you want more than two or three days worth of such illumination, the Krill really starts to save you weight -- and space -- running away from the chem-light competition. Price is another consideration. The Krill Lamp is not inexpensive, retailing for $25 and $30 for the standard and Extreme models, respectively, plus the cost of batteries. Of course, alkaline AA-cell batteries are dirt-cheap even in modest quantities. Lithiums, on the other hand, will set you back around $4.50 a pair. 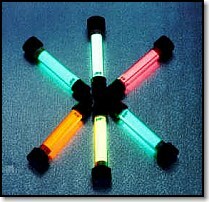 The price of chem-lights varies, but typical retail ranges roughly from about $1.75 to $3. You can do the math, but it's pretty clear that if you use a lot of chem-lights on a regular basis, especially for only a few hours at a time, the Krill Lamps can save you a bunch of money. And, yes, the relative difference remains similar even if you consider wholesale and bulk pricing. For the occasional user, or for survival use, the price and weight differences may both come into play. However, illumination performance is also an issue when selecting both the version to use and when comparing the Krills to the chem-lights. 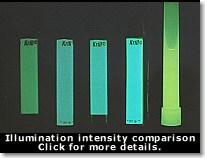 Kriana's literature claims the standard Krills meet the Mil-Spec minimums for chemiluminescent lamps (which specs are only 3.06 fL at 15 minutes for a 12 hour green lamp according to the literature supplied by Kriana) and that they are as bright as a chem-light after one hour's activation. The former may well be true, but in out tests we certainly didn't see the standard lamp as being as bright as the Snaplight or Cyalume we tested it against. While there is some optical illusion created by virtue of the difference in the green colors, a light meter showed the standard Krill as being less than one half as bright. Even the Extreme model wasn't as bright, only the 180 Extreme matched the chem-light's illumination output after one hour in our tests. Note, however, that the illumination is consistent over most of the Krills' rated battery life, and then only dims a barely perceptible amount towards the end of their rated life, compared to the chem-lights that start to dim after a few hours and considerably so towards the end of their ratenvgd life. Kriana claims the Green standard Krill (360) produces 5.5 fL (Foot Lamberts, a measure of luminance - 1fL = 1/ pi candelas/sq. ft.) of luminance, the 180 Krill - 8.5 fL, the Extreme (360) - 10.5 fL, and the 180 Extreme - 15.5 fL. We were unable to measure Foot Lamberts, but the ratios appear about right from our tests, both subjectively and using the light meter. The Blue, Orange, White, and Yellow Krills are about 70% as bright as the Green, the Red only about 50% as bright, according to Kriana. Our Orange sample conformed to that ratio. This is the result of the filters required to produce the colored light from the native green. The colors other than green are designed primarily for use as signals and markers by law enforcement and the military, and don't provide much benefit for most survival or outdoors uses. The chem-lights also exhibit a bit less brightness in some of the colors, but the difference isn't quite as large. To provide the increased brightness of the Extreme Krill, the voltage output and frequency are both increased, which makes for a nearly 100% brighter light and a corresponding loss of battery life of just over 50%. The 180 versions power the EL lamp at the same rate as their respective 360 degree lights, but the lamp is only one half the area, which results in about 50% greater light output for the same battery life. One thing that is often annoying about the chem-lights is that 360-degree illumination. In many, if not most situations, you really don't need all that light, all it does is shine in your eyes, making is harder to actually see what you want to look at. In most situations what you really need is only a portion of the light shining where you want it, away from you. There are numerous solutions, ranging from blocking the light with your hand, to a strip of duct tape, to Velcro strips (like used on the 180 Krill versions), to the military style chem-light shield (which also allows you to "shut off" the light by twisting the pair of tubes so the slit is blocked). The 180 Krills solve this problem and give you more light to boot for the same battery life, not a bad deal at all. Conversely, one area the chem-lights have it over the Krill is general area illumination, at least from the perspective of lighting up the area from overhead or on the ground. Not only are they brighter for the most part, but the light also comes out the bottom and top of the unit. While you wouldn't expect that small area to make that big a difference, it is very noticeable when hung overhead, especially if it is an open area and there are no surfaces off of which to reflect the light. It is somewhat less of a problem in a more tightly enclosed space, such as the inside of a small canopied life raft or a tent. In an open area from a height of six feet, the 180 Extreme Krill facing down illuminates the ground about as well at the chem-light hanging straight down, but the chem-light also lit up a much larger area, nearly twice as large. In practical terms, what all this means is that for most people and most uses, the Extreme versions are going to be your best bet. The standard Krill (360) is bright enough to read a book by, if you hold it only an inch or two from the page. It provides a minimally acceptable level of general illumination for fully night-adapted eyes, though one tester with less than perfect night vision found them totally unacceptable. In other words, you can avoid walking into things, but it may be difficult to tell what it is, exactly, you're avoiding. However, if you happen to be using a night vision device, well, then it's just fine. In a tightly enclosed space, especially if the surfaces are at least minimally reflective, it will provide a minimally adequate level of illumination -- just. For marking purposes, the standard Krills are adequate in truly dark situations and can be seen for approximately 75-100ft. (22.9-30.5 m). However, if there is even a minimal level of ambient light, whether from a bright moon or city lights, the Extreme Krill would be a much better choice. Again, with NVG devices the lower powered standard Krill would be fine. The 180 Krill is a lot better than the standard, and would be the minimum I'd suggest for most uses. Unless you really need the 360-degree illumination, this is a far better choice and the best selection if maximum battery life is an issue. If you can live with the 50-hour battery life, which I expect most of us can, the Extreme Krill and 180 Extreme both provide enough illumination to be generally useful. Again, unless you need the full 360-degree illumination, the brighter 180 Extreme is your best bet. If the Krill Lamps have a downside, aside from those already mentioned, it is that they are an electronic device. It seems that sooner or later, all electronic devices will fail. At least with most solid state devices, if they work after a reasonable "burn-in" period there's a good chance they'll continue to work for a long time, absent abuse or other adverse circumstances. Before packing the Krill Lamps away, I'd suggest running them for a full battery cycle, just to make sure. I'd also suggest that if your need is critical, make sure you carry two (as with all such instances, ideally from different manufacturing lots, though I'm not sure how you'd be able to tell that with these devices). It also has to give you a little pause when a company makes a big deal about how tough and durable their products are, and how long they'll last, and then doesn't back it up with a substantial warranty. 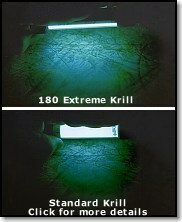 The Krill Lamps come with only a short, 90 day limited warranty on materials and workmanship. When we spoke with Kriana, they advised that they are working on the final details of a much better warrenty and we'll update you on this as soon as it is put into place. 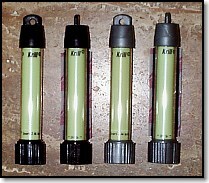 These Krill Lamps, or the chem-lights they will replace for many uses, are not a replacement for a good flashlight. Neither does a flashlight make a good substitute for one of these. The flashlight is designed for higher intensity point lighting and has a relatively limited life. The Krill is designed to provide low to moderate, relatively wide and general area illumination or marking, with very long life. They are complementary, not exclusionary. If you must choose only one for some reason, prioritize your needs first and then pick the one best suited. The Krill Lamps offer a host of advantages over conventional chem-lights for most typical consumer uses, and many law enforcement and military uses, though there are exceptions. For most people, in most situations, the Krill Lamps provide a superior alternative to standard chemical light sticks for use as a lighting or marking device. If your use is only occasional, the price may be a significant issue, but only you can decide if the advantages outweigh the higher initial cost. There is also the matter of the too brief warranty which hangs like a cloud over the product, but which will hopefully soon be taken care of. As for me, I'm impressed enough that I'll be placing a pair of 180 Extreme Krill Lamps in my survival kits, together with a set of lithium batteries. However, until we gain some long-term real world experience, I'll not be tossing out all of those chem-lights. © 1999 - 2004 Douglas S. Ritter & Equipped To Survive Foundation, Inc.